Ms Wynter is at present a teacher in the city, but has always been interested in local politics and supporting community activities. 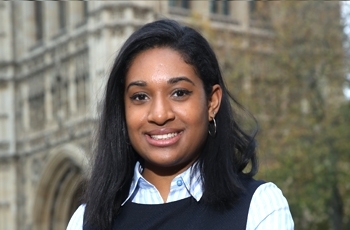 Last year she shadowed local MP Kerry McCarthy who gave her so much support and insight that has clearly paid dividends and inspired Ms Wynter to stand for election. OBV has had a long history of nurturing BME talent in Bristol. It began nearly 20 years ago with Georgia Ramsey JP who became OBV’s first Magistrate to be appointed from that scheme. Georgia went on to chair the Court’s Bench, which is the highest role within the Magistrates’ Court. Sharon Thompson JP followed Georgia and is now the present Chair. Ms Thompson has also just overseen the largest intake of BME Magistrates the city has ever seen in the last year recruiting a further eight BME magistrates in Bristol. But turning to the highest political office in the city - The Mayor’s office - where OBV alumnus Marvin Rees presides. When elected three years ago, he become the first directly elected Mayor of African- Caribbean descent in Europe. Last year Marvin hosted the Global Mayors’ Forum in his home town. The other OBV alumna who is now a Bristol Councillor is Carole Johnson JP. When we began in Bristol there was just one BME councillor, now there are seven BME elected representatives including the Mayor and his Deputy Asher Craig. But back to Sangeetha, the next generation of Black leaders. We of course wish her all the success she richly deserves. On hearing the news of her selection she humbly wrote, ‘I would not be here had it not been for the support of OBV’. I’m not so sure about that, I do however, think our role might have been to fast forward her journey, to be where she is today. What is clear is that this is a young woman to watch. If elected, she’ll be a brilliant role model and a dedicated public servant.